Gap 360 stretch denim line. Have you been a victim of slacker jeans? You know, the ones that fit like a dream when you bought them a few months ago, but got lazy along the way and now sag around the backside and knees? You’re not alone! One remedy is label reading, and approaching stretch in a fabric as you would sugar in coffee: only a dash is needed. Higher amounts can compromise a long-lasting snug fit. And, while jeans made of 100% cotton have made a major style comeback (thank you, Re/Done) they too can shape shift. “Just remember, denim softens over time and wear, so it won’t always be as stiff as the first time you put it on,” says Gray. How you care for jeans plays a role here, too. Minimal washing is ideal as is choosing line drying over a hot dryer cycle, which can break down fibers and reduce their ability to bounce back. Women wearing distressed jeans at NYFW. Fact: some of the best new jeans don’t actually look that new. 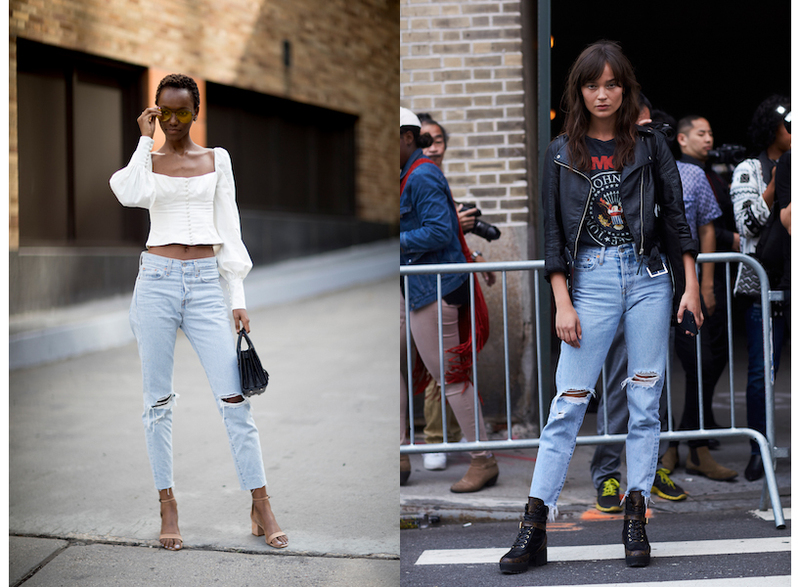 Rips, holes and other worn-in accents are part of denim’s coveted cool factor. But how those details on any given pair treat your shape can only end one way. It’s either a yaaasss kween or a hard pass. “Watch the placement of whiskering, distressing and fading as they place emphasis on the areas where they’re located,” cautions Gray. Translation: if you want to downplay a body part look for subtle accents rather than extreme ones. Adams-Geller is also a fan of less is more. “The most modern details should look natural and worn-in, not contrived. I think this is the most flattering on the body as well. I really like jeans that have distressing, grinding and fading around the waistband, front pockets and back pockets,” she says. Shopping for jeans can feel like watching Game of Thrones: it’s anyone’s guess how it’s gonna end! A complete lack of universal sizing across fashion labels doesn’t help. “A regular fit frustration is the range of fit across brands,” says Ruth Basloe, Styling Director at Nordstrom, “it’s possible to wear a size 28 in one brand, but switch to a 30 in another.” If you’re shopping at a store that carries several denim lines, tap into the expertise of a sale assistant for suggestions. And wherever you shop, don’t let a number on a tag ruin your relationship to your measurements. Your dream jeans are out there. Just tap into your inner Daenerys and use an open mind, determination and patience to find them. Jeans may cover your entire bottom half but it’s the portion at the mid-line that deserves special attention. We’re talkin’ ‘bout that rise, people. “For all body types, higher-waisted jeans help accentuate natural curves, adds length to the legs and creates a great hourglass frame,” says Gray. Sounds good, right? It’s also the cut Basloe considers a must-have. “What feels most current is the high waist straight leg silhouette. In terms of detail, the variations in hemline using step, slanted, slit, and a variety of embellishments are most exciting for Fall,” she says. Women wearing trendy jeans at NYFW. Fashion pop quiz: if you’re 5’9” and your bestie is 5’4”, can you both swear by the same style of jeans? The answer depends on where you’re shopping. “Check to see if the denim comes in multiple lengths – even for cropped jeans,” says Gray. Retailers like Gap and J.Crew offer specialty sizing, with inseams tailored to different heights from petite to tall. Similar options can be found within the Levi’s line, with lengths that range from 30 to 34 inches. Just know that you might not be able to share all the jeans, all the time. The fact remains that some lines simply suit different body frames better than others. Jacqueline Straight Lacey Indigo jeans, $395, PAIGE.com. Given that they’re easily worn practically anywhere, super comfy and always look stylish, jeans have earned their superstar status. But to build an iconic denim wardrobe one must Mix. It. Up. All body shapes can benefit from a pair of skinnies that fit like a glove. 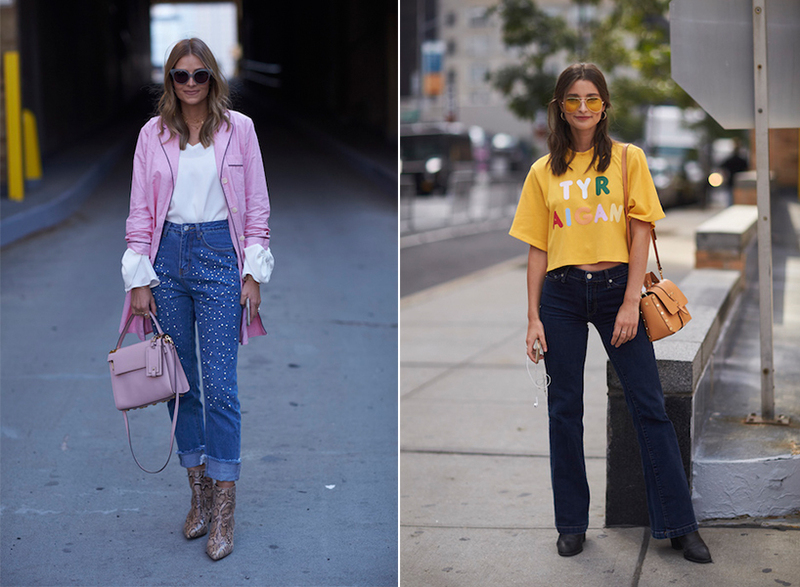 Straight leg cuts continue to be the It Girl jean du jour, while there’s no arguing with the figure-flattering power of a bootcut or flare leg style. And wide leg silhouettes are also going strong. “Classics never go out of style but I am excited about our ever-black denim collection, playing with cheetah and camo prints on denim, and raw hems,” says Gray. Hems are a big deal for Adams-Geller, too. “I’m loving all of the new hem details for Fall 2017—angled, heavy frayed, ruffled and many more,” she says, “My favourite new style features a high-rise straight leg silhouette in a vintage-inspired wash with a beautiful blue velvet lace-up detail at the ankle.” The lesson: stick to only one style of jeans, or forgo trying on the latest trend, and you’ll miss out.